Who doesn't love Paris? 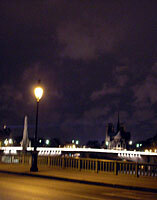 Actually, when I first went there as a child, I wasn't captivated by the City of Light -- I liked London a whole lot more. But Paris has certainly grown on me over the years. I'm not a Paris insider, by any stretch of the imagination, but I have a few favorite places to go when I'm there, touristy and non-touristy. 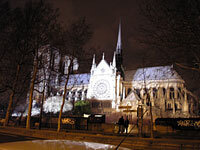 There are also many Paris insider websites out there to help you do some research. One I like to check is Paris Notebook. The guy at the car rental agency had a sick sense of humor, I'll give him that. On one of those "pouring rain, now it's not, now it's pouring" days, we decided we would stay on plan and brave the drive out to Chartres. None of us had ever driven an automobile in Paris before (you can hear the gods cackling already) but we scurried gamely across the river and swam toward the Carrousel du Louvre and shook ourselves out like wet Labradors in front of the rental office. The car transaction went well. Check. Got directions on how to get to the highway. Check. Found car in the garage. Check. Car turns on, heat on, windshield wipers in order. Check, check, check. My husband sets the car in motion and we make the turn out of the garage and left, as the man told us. Left turn puts us on the Rue du Rivoli. Nice man said "Make next left." (Those of you who know Paris know where we're going with this.) Next left puts you onto the Place de la Concorde. I think I saw this in a movie once. It was called "Ben Hur." Round the Obélisque, the rain is slapping against the windshield, our reins are swinging wildly. "Which way? Which way?!" shouts my husband. I still assert that I answered quite calmly, "Follow that van across the bridge." Well, perhaps it was a little more terse than that. Now, a year later, we can look back and agree how nice it is that drivers in Paris are decisive. It makes you a bit quicker on your feet. Or wheels. Driving tips from Petite Anglaise. L'Ardoise, 28 rue Mont Thabor, 1st., 011-33-1-42-96-28-18. Fabulous market menu concoctions from PIerre Jay. Michelin star quality, without the Michelin star attitude or pricetag. Marche Bastille Farmers Market, Richard Lenoir at Place Bastille Thursday and Sunday from 9-1 pm. A fantastic place for produce, meat, cheese and bread, plus random household items. L'Ami Jean, 27 rue Malar, 7th, 011-33-1-47-05-86-89, a Basque/French style menu offering imaginative 30 Euro prix fixe meals. Now run by Stephane Jego of La Regalade. Taillevent (Wine tastings) 199 Rue du Faubourg Saint-Honoré Métro Charles de Gaulle Etoile, 8th Arrondissement, 011-33-01 45 61 14 09. Sure we eat there all the time. Not. but you can do their free Saturday tastings from the legendary wine cellar from 10 a.m. to 6:30 p.m. Visit the website and click on (in French only) “Les Caves Taillevent,” then “Nos Prestations” and then “Les Degustations" for the schedule. The local transportation (Métro and buses) is handled by the RATP. You can buy single tickets (€1.40) for each ride on the Métro , or get a carnet of 10 (€10.90). For a week's stay, a Carte Orange Hebdomadaire is only €16 if you're staying within zone 1-2 (which is where almost all the major sights are anyhow). They also offer a monthly Carte Orange Mensuel for €52.50. Bear in mind that to get a Carte Orange though, you'll need a small ID photo to put on the card. The Paris Visite pass is a RATP program as well and it allows visitors unlimited travel on the Métro , buses, RER or tram for 1 (€8.35), 2 (€13.70), 3 (€18.25) or 5 (€26.65) days. You have some choices as to how many zones of travel in the city to access, but most sites will be within zones 1-3 anyhow. The pass also gives you discounts on some museums entry fees. The Paris Museum Pass is a different animal, which doesn't get you on the Métro, but is worth a look if you're a museum buff who's planning to be in Paris for 2 days (€30), 4 days (€45) or 6 days (€60), and will hit more than two places per day. The list of museums it covers is extensive, and includes the reopened Orangerie, but the real bonus is that you don't have to wait in all those lines at the Louvre and the d'Orsay, you can just head on in without queuing. Do note that some museums like the Musée Carnavalet, the Musée Cognacq-Jay, the Petit Palais and the Musée Balzac, are always free anyway and many of the big ones, including the Louvre, the d'Orsay, the Cluny, the Musée Rodin and the Musée Picasso are free the first Sunday of every month. For a list of free museums in Paris, check out this guide from Reid Bramblett. Hôtel Langlois, 63 rue Saint Lazare, 9th, Tel: (011-33) (1) 48 74 78 24. This remodelled and stylish hotel is located near the church of the Trinity, Olivier Messaien's old stomping ground. Okay, that's not going to be a selling point to everyone, but it's also within walking distance to the Opera and the jewel box-like Gustave Courbet museum. Rooms 63 and 64 have views of the Sacre-Coeur over Paris rooftops. What more can you ask? Hotel Quai Voltaire has the distinction of being the second to last hotel that Oscar Wilde stayed in before he died. It has a bit of that look -- you know, where writers who are down on their luck stay shortly before they expire. But it is clean, and spectacularly located facing the Seine just opposite the Louvre. Literally steps away from the Musée d'Orsay on the Left Bank. If you get a room facing the river, you can get a fantastic feeling of throwing open the windows and gazing across Paris in the morning, but beware, the traffic can be very loud. There's no air conditioning and if it's hot, you'll want the windows open. Hotel Jeanne d'Arc is a hotel that I've only heard good things about. I've never stayed there, but it is located in the Marais close to the Place des Vosges, and comes recommended by friends as a great budget option -- miniscule elevator notwithstanding. If you know anything about it, email me! The Hôtel-Hospitel Dieu, 1 Place du Parvis Notre Dame, 4th, Tel: (011-33) 1 44 32 01 00, is another hotel that sounds thoroughly intriguing. Is it a hotel? Is it a hospital? Yes, indeedy, it's both. It stands immediately opposite Notre Dame on the Ile de la Cité in the top floor of the hospital founded in 651 A.D. by Saint Landry. Honestly, how can you beat that? Le Petit Chatelet, 9 rue Saint Denis, 1st, Tel: (011-33) 1 42 33 32 31, is a collection of simple, tastefully furnished apartments at not unreasonable prices if you're looking for that "living in Paris" experience--especially if that experience includes living in the 1st. If I were allowed, I would take a large steamer trunk to Paris every month, fill it with goodies and have it shipped back to me. Cheese: Cheese is not hard to find in France. To say the least. We've gazed through the window at the austere and intimidating Marie-Anne Cantin(12 rue du Champ-de-Mars, 7th), and been advised to go to M. Barthelemy (12, rue du Champ-de-Mars, 7th), but most endearing was the little neighborhood fromagerie at 31 rue Cler. Not intimidating at all! Phew! Mustards: Maille's boutique at 6 Place de la Madeleine sells all the amazing mustards that you can't get anyplace else. No, really. Go, buy all the ones you can find. You can't even mail order these flavors. Chocolate: Okay, I understand that there are tons of chocolate places out there, but I just can't get that soft, melting sigh anyplace but at La Maison du Chocolate. The staff is always immaculately outfitted in chocolate appropriate businesswear, but it was one of the few places where we just bit back the fear of intimidation and bought as many chocolates as a tourist could afford (not many). But one little bite and you'll go floating down the street like the red balloon. Bread: Pain Poilâne (8, rue du Cherche-Midi) is all over Paris, and for good reason. Personally I like to stand just inside the shop door like a little Eponine and sniff the air -- that fantastic baking bread smell. 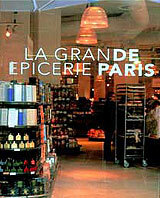 Just plain glorious food: La Grande Epicerie in the Bon Marché at 38 rue de Sevres -- it will blow your mind. I fantasize about being offered one of those shopping challenges where they give you a basket and say "You have four minutes to run through La Grande Epicerie. Whatever you can get in your basket, you win." Dishware: Porcelaines M.P.Samie is like a crackhouse for those of us who love French white dinnerware. Two giant floors of goodies can be found at 45, avenue du Général Leclerc in the 14th Arr. 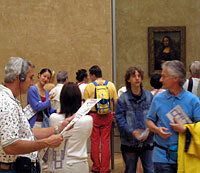 There are probably as many museums in Paris as there are cheeses in France. This handy little Museum GUIDE can help you locate most of them. See my comments above regarding a Museum Pass. The big gun of course is the Louvre Museum. My advice is to either go very, very early, or very, very late. If you're interested in seeing the Big Three Art Items (The Winged Victory or Athena Nike, The Mona Lisa, Venus de Milo) my favorite method of attack is to go super early before most of the tourist hordes have descended on it. If you're seeing anything else, you probably won't have to worry about crowds -- hardly anybody is ever in the gallery with the de la Tours on the top floor, for instance. The pyramide is a nifty-looking sight, but forget about going in that way. Enter instead from the underground Carousel -- there's an entryway near the arc outside, and another on the north side of the Louvre on the rue du Rivoli. This takes you to the space under the pyramide much quicker. Go for an hour every morning for a few days. Leave when the tourists arrive. It's so much nicer. The same pretty much goes for the Musée d'Orsay across the river, which always has lines winding through the plaza, around the corner, and up the rue in the high season. Go early, way early. 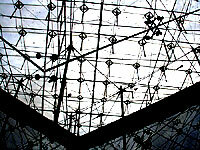 You'll have a lot less trouble at the Centre Pompidou, the crazy "inside out" building in the Fourth Arrondissement. It's rewarding inside though, as their modern collection has a lot of terrific pieces laid out in a truly spacious gallery. If Monet is your thing, but the crowds aren't, try the Musée Marmottan, which is a lovely little collection housed in an old town house near the Bois de Boulogne. 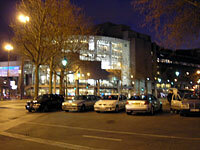 One of the largest collections of the prolific Pablo Picasso can be found at the Musée Nationale Picasso. Again, beware the crowds. For medieval art, the Cluny Museum, tucked away in the Latin Quarter has the breath of history about it. 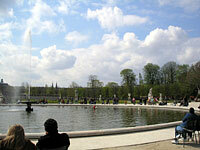 Ruins of Roman Paris can be seen outside the museum, and the lovely gardens are a great place to sit with a lunch. One of the small gems of Paris is the well-preserved residence, Musée Jacquemart-Andre. Recently reopened are the Musée de l'Orangerie and the Musée de Petit Palais. I haven't ever been to either, but the word is that they are both quite worth the time for a visit. Check their exhibition schedules online. And also off the beaten path (and into the sewer) is the Musee des Egouts de Paris, or the Sewer Museum of Paris. Thanks to Linda for suggesting this one!